Central location close to many tourist attractions! Completely Furnished 4BR, 2BA with a Loft. Living room kitchen combination. 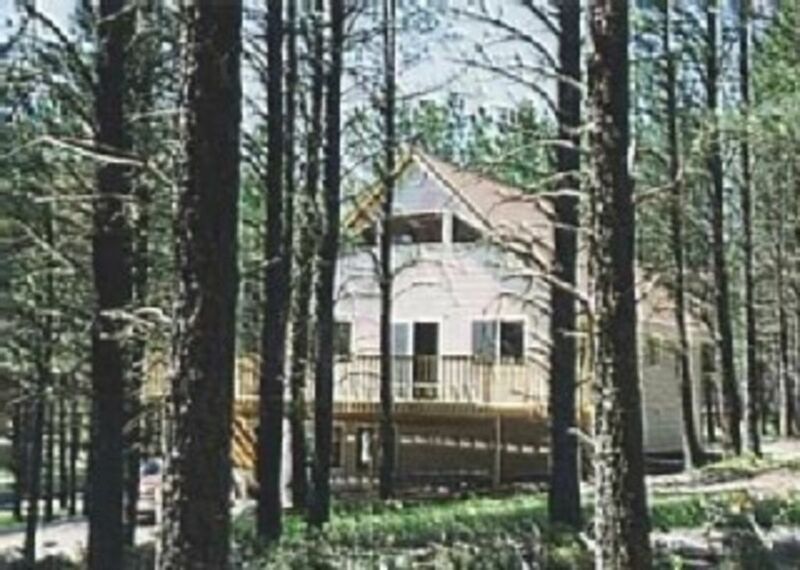 This newer home is nestled on a 1 acre lot among the pines, next to the National Forest in Alpine Acres, South Dakota. This Central location puts you just 20 minutes from casino gambling in historic Deadwood, 20 minutes from Rapid City, Hill City, Pactola Lake, Sheridan Lake, Deer Mountain & Terry Peak. It is also close to the Mickelson Trail for biking & close to the Experimental Forest for snowmobiling or 4 wheeling. This home is completely furnished, so whether you are sitting in the great-room watching TV or enjoying a barbecue on the elevated deck, you will be as comfortable as sitting at home. Planning a family vacation, an annual hunting trip, skiing or snowmobiling or attending the Sturgis Rally? This home offers room for everyone. Sleeps 10 - 12 comfortably. Amenities: Large elevated deck with gas grill and picnic tables. Loft is furnished with 4 twin beds. The main level of the home has two bedrooms each furnished with a Full and twin size bed. With plenty of closet space. Two other bedrooms are located on the walk in level of the home. Each is furnished with bunk-beds and a full size bed. Ceiling fans throughout the upper level, TV, VCR, DVD player. Fully equipped kitchen with small appliances, cooking and eating utensils, linens, blankets, towels and all basic necessities are furnished. Washer and Dryer are located on the lower level. Horseshoe driveway for off street parking. This was a great place to stay. Good central location for Bike Week and sightseeing. Everything we need was there. It was nice to be off the main roads where it was nice and quiet. My extended family and I stayed at this home in November and we were pleasantly surprised by the amenities. It was very comfortable for a party of 12 and we had everything we needed. Thank you for sharing this beautiful and peaceful location! Convenient location, not very well kept property. The description of the amenities was not as clear as other properties we searched, for example they omitted there is no AC ( not air conditioning). The property was not well kept when we arrived, we found many dead insects in the kitchen area, we even found a live worm in one of the kitchen pans we tried to use; the furniture in the rooms was very dusty, the bedspreads smelled "musty". Really bad customer service since the owner broke the contract, as she required a deposit fee ( a check and she stated we would get it back) she cashed it quickly BUT after receiving payment in full for our complete stay (7 nights) she never answered our emails again and, of course, a week after we are back we have not received our deposit back (as she stated in writing) or any form of answer to our emails. I wouldn't recommend this to anyone unless you want to lose money. We enjoyed the area and surroundings in spite of the HOT evenings (in the property) with no AC and NO disclaimer about it. We are truly dissapointed since it put a bad experience in our first time in the area and probably will not ever use this website again after this type of unprofessional owners taking advantage of tourists. Sorry I wasn't able to respond to your email when you checked out. I was traveling during your stay and without internet. It's unfortunate you didn't try to reach me by phone while you were there since we communicated by phone frequently when you booked your stay. I mailed your deposit check on the 31st of July when I returned which was within 7 days after your departure. I am sure you have the check by now. We take great pride in our cabin and have many returning visitors, all of whom love the location, the property and amenities. I've never received anything but positive reviews, including last weeks visitor who was there right after you who said "Thank you for letting us use your beautiful cabin." The property does not have air conditioning and I am in the process of talking with homeaway/vrbo about how to detail this since the settings only let you check a box if you have air, but don't give you the ability to highlight that you don't. In the 10 years of having multiple families stay there, including my own, the lack of air has never been an issue due to the wonderful black hills climate. i have stayed at Six Guns 3 or 4 times with friends during the snowmobile season. My also family used the lodge as a central location for a family reunion during the summer. All of my experiences have been incredible and exceeded my expectations. The owners have been responsive and accomodating to my/our needs and were quick to reply with answers to our questions. My family and I have enjoyed staying at “Six Guns” on numerous occasions and always find it a beautiful, relaxing setting in which to get away. It has all the comforts of home while providing both central proximity to tourist attractions and/or the remote Black Hills experience. Winter or summer, we look forward to our next stay! Great layout for a group/family get away! I can not say enough about the good times that have been had at the Six Guns Lodge. Myself and a group of between 7-8 guys have stayed at this home 4 times now and we have always enjoyed our stay. It has a great layout and we thoroughly enjoyed being able to have everything available to make great meals for the group. We also enjoyed late nights hanging out with the guys playing cards until late in the night. And the location was great! Other Activities: Mount Rushmore & Crazy Horse Mountain, 1880 Train, Casinos in Deadwood, Lead Gold Mine, Tomahawk Golf Course, Trout Haven, Prairie Berry Winery, Buffalo Roundup, Sturgis Rally, Mammoth Dinosaur Dig, Harney Peak Hiking, Terry Peak Skiing, Moonshine Gulch Bar. from $200.00 a night Rates subject to change without notice. Deposit of $200.00 required to guarantee reservation. The deposit will be refunded l if cancellation is made at least 45 days prior to arrival. No deposit refunds will be made with less than 14 days notice. Full rental payment is due 20 days prior to occupancy. Cleaning fees are included in rental price. Rates could change depending on how many people there are in the party. For August 1st through the 15th the pricing depends on how many guests and motorcycles you bring for the Sturgis Motorcycle Rally.